Forrest Gregg of Green Bay Packers, as seen in this 1964 portrait. Gregg played college football at Southern Methodist University in Dallas. He later was head coach for the Mustangs and was eventually served as athletic director until 1994. A member of the Hall of Fame, Gregg starred at tackle and guard. He played on six NFL/NFC championship teams and three Super Bowl winners, including Super Bowl VI with the Dallas Cowboys in 1972. He was elected to the NFL's all-decade team of the 1960s and its 75th anniversary team. 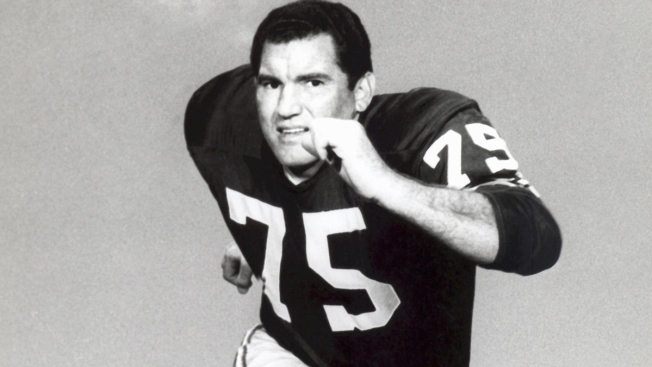 Gregg began his NFL career in 1956 and played a final season with the Cowboys in 1971.